One of the first books my parents gave to me as a child was an atlas, a gift that I credit with kindling my life-long fascination with world geography. I loved the bright color maps of countries and regions I hadn’t even heard the names of before. I studied the accompanying photographs, charts, and statistics with great intensity. After that first atlas I couldn’t get enough, wallpapering my bedroom with the maps that came in National Geographic magazines, getting new and bigger atlases , and memorizing lists of the largest islands, longest rivers, most populous cities, etc. I think this all appealed to me because atlases and maps provide one way to imagine and relate to the rest of the world. Maybe it was this early childhood exposure, but for me the world is organized in my head as one big map, and everything else, cultures, languages, histories, places, current events, and even some memories, are just layers to be accessed from this underlying picture. Is this the way you think? I’ve explained geography to others as having two fundamental components: (1) the physical reality of our world, like the oceans, great rivers, and high mountain ranges, and (2) the relationship of one place to another, like how Great Britain is separated from mainland Europe by the narrow English Channel. These fundamental components are, well, fundamentally important to the long development of human civilization and the common facts of everyday experience. San Francisco has its remarkably consistent temperatures because of its location on a peninsula adjacent to the Northern Pacific and the cool California Current that flows along America’s west coast. Great Britain avoided invasion in World War II because Hitler’s war machine lacked the naval craft to cross the 20-mile wide Straight of Dover. India and China border one another but their civilizations have little in common because they’re physically separated by the highest mountain range on Earth. Geography is central to these facts. The story of history and the interactions of civilization are substantially informed by the geographical relations of people and places; that’s what the term geopolitics means. And the facts of everyday life, the language you speak, the weather you experience, the types of outdoor activities you participate in are inextricably linked to geography. Anyway, for me, it’s the results of geography, the histories and cultures and climates and sights, which make maps, our most basic visualization of geography, so endlessly interesting. In fact, my girlfriend finds it amusing that even now whenever I’m confronted with a map I can’t resist studying it with terrific focus. And maps are more than functional tools, they can also be art. A few years ago the Walter’s Art Museum in Baltimore had a wonderful exhibit on maps. 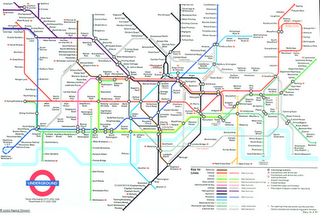 It included ancient tapestries of the then known world to the modern stylized depiction of the London Underground system. And it’s hard to not appreciate the clarity and simple beauty of the London Underground system map or the wonderful detail and color of the (very best, in my opinion) road maps provided by companies like ADC . An ADC road map of Washington, D.C.
There’s only one drawback to traditional maps – they’re static. Any given map is set at one scale and depicts just one area (even if it’s the whole world). You need an entire book (an atlas) to show maps of different locations, details, and data, and that still doesn’t allow for reader configuration of the format or content. But the internet, smart phones, and the massive proliferation of information is changing all that, and more interestingly, proposed enhancements from Google and Apple might take maps to their fullest expression. 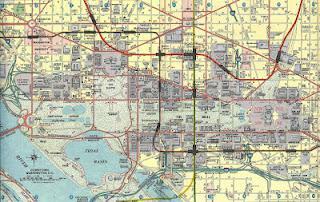 Starting in the 1990s Mapquest and other sites began to offer digital maps, usually for road directions. I didn’t care for these maps because you could only see an area the size of your computer monitor and the maps themselves were rather dull to view. But when Google Maps came out in the early 2000s the aesthetics began to improve and over time they have added important enhancement like an ability to scroll across the entire globe, zoom in an out for greater or less detail, and new layers providing satellite imagery and terrain. Google’s companion Google Earth application added the ability to change perspective and included 3-D buildings in major cities. Later Google added Street View shots taken from cars mounted with cameras providing 360 degree views that let you actually see – not imagine – what a place looks like. This is a massive shift, converting a map to a far more sensory and immediate experience. Now it’s possible to view, say, the streets of Rome without ever having traveled there. Certainly this is no substitute for actually being there in person, but it does bring views of places all over the world right onto your computer screen. Other functions allow you to toggle on features like up-to-date traffic information, user photos, labels, and links to Wikipedia articles. And this doesn’t even touch on the powerful linking of maps with GPS, which shows you just where you are and can direct you to just where you’re going, anyplace and anytime. Now Google has announced that they plan to add even more functionality to their maps, including more 3-D buildings and street view shots taken by pedestrians of places where cars can’t go, allowing a user to view cities as if they were in a helicopter, or see nature along hiking trails from thousands of miles away. These changes have been added incrementally over the last decade so you might not realize just how incredible they really are. No longer are maps 2-D static views limited to a specified area and providing limited information. Google Maps, and probably Apple’s soon to be released map application, provide users a map or satellite photo of any place on the globe, street-level views along a growing network of roads and soon along non-road areas of interest, links to encyclopedia articles, and access to real-time information like traffic conditions or the proximity of coffee shops. And you can do it all from you mobile phone. Enhanced views, more information, and real-time data; that is a mapping revolution. I wrote above that in my mind I view the world as a large map with much of my knowledge and experience layered onto the underlying structure. Aren’t these new and improving interactive digital maps getting closer and closer to this mental image? The more functionality that is added, the more information is linked, the closer we get to a version of a map that I could have only dreamed of as a child. If there is one area where static maps still beat their digital cousins is in presentation. 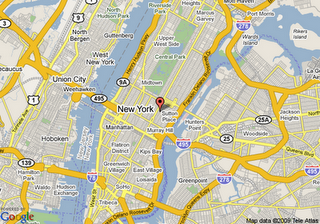 Static maps, done well, are far more visually appealing than Google Maps or any other product available on the internet. 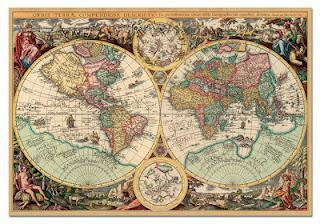 There will be no museum exhibits showcasing digital maps (at least not in their current form). And there is an inherent limitation to maps that are restricted to showing only an area the size of a computer monitor or the even more restrictive smart phone screen. I have little doubt that Google and Apple will continue to improve the visual presentation of their map programs, but who can say if they’ll ever be as good as a printed version. I still have a large map of the United States hanging on my home office wall and I still find myself studying it from time to time. Next to my office desk are several atlases and I do occasionally pick them up and flip through their pages. But it’s to the computer I mainly turn for maps now. The functionality of digital maps is just too useful. Hopefully one day the style will match the substance, and then we might really have the ultimate map. Including an old one my uncle had from the late 50s that included a lot of post-World War II/early Cold War names and notations and anachronisms like Japan regaining full sovereignty after the 1951 Treaty of San Francisco or South Africa still ruling Namibia (or Southwest Africa as labeled).